The Samsung Galaxy S5 may have been superseded by the gorgeous Galaxy S6, but that doesn’t mean it’s not still an excellent phone. Those who already own one will want to hold on to it — not least due to the excellent IP67 rating for dust and water resistance, which the S6 doesn’t have — and it can still be purchased new for a more competitive price than ever before. Either way, the Galaxy S5 is a phone worth protecting from from scratches, bumps, and falls. Here are some of the best Samsung Galaxy S5 cases around to keep the star shining. Updated on 6-14-2015 by Simon Hill: Refreshed text and format, added cases by Cover-Up, Ballistic, Body Glove, Proporta, and Diztronic. If you want to cover that dimpled back with natural wood, then look no further. Cover-Up offers a wide range of different natural wood finishes including cherry, mahogany, maple, walnut, cedar, and many more. Your Galaxy S5 snaps into a black polycarbonate shell — in which the wooden back panel is sunk — which has a minimal design, leaving ports and controls open for easy access. This is a lightweight case, so it won’t provide really rugged protection, but it certainly adds a tough of style. This case is all about multi-layer drop protection. First, there’s a flexible inner layer with heavily reinforced corners that deals with impact-related shocks, then a tough polycarbonate shell that locks into place over the top. The button covers are easy to find and use, the cut-outs are large enough not to interfere with functionality, and the case adds some grip. You also get a basic screen protector in the package for complete coverage. 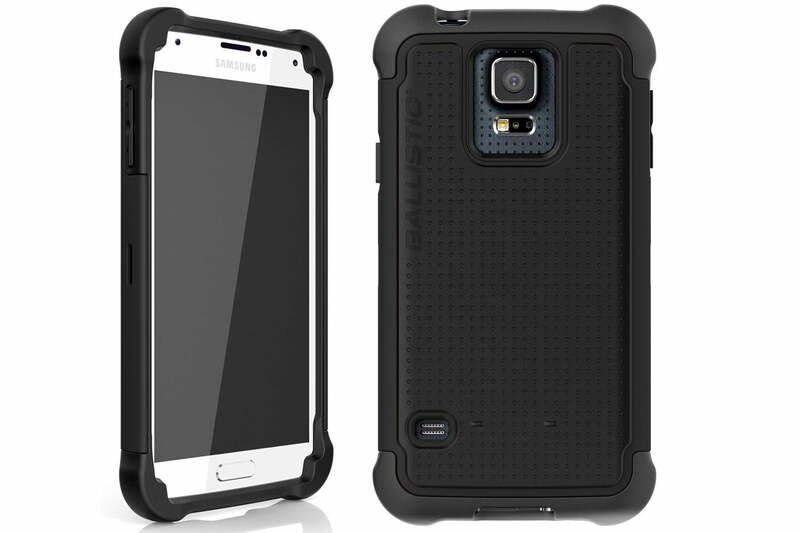 You don’t have to spend a lot to get a really rugged case for the Galaxy S5, as this effort from Body Glove proves. Your phone slips into a solid frame with a built-in screen protector and a reinforced, shock absorbent shell goes around it. The end result is drop protection you can rely on, tested to military standard 810G. The cut-outs are accurate, the button covers are clearly marked, if a little stiff, and there’s a cover for the headphone port to stop dust finding its way in. The weak link is the screen protector, as it inevitably gets marked and worn over time. 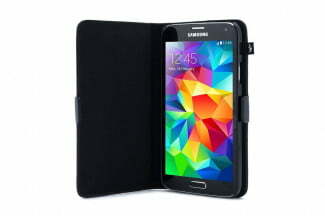 If your top priority is keeping your S5 safe from bumps and falls, without spending too much, this is a good choice. Sadly, you’re not going to get a real leather case at this price, but Proporta’s “leather style” folio case is a decent option for the budget conscious. Your S5 slots into a thin plastic tray inside, and the fake leather cover wraps around it. There’s soft microfiber on the inside, but no pockets. You can also fold the cover back to use it as a landscape stand. It stays shut thanks to a magnetic closure clasp. The tray is thin and provides full access to controls and ports. You’ll also find a large opening in the back so you can use the camera with the case on, though it is a little awkward with this kind of folio case. The main attraction with this simple TPU case is the fact it works with the wireless charging cover. The design is distinctly understated with a matte black finish and a subtle logo on the side. The button covers are easy to press, the cut-outs are accurate, and there’s a thin lip on the front to provide a little screen protection. It’s flexible, so it’s easy to fit, and it should guard against minor bumps and falls, but it’s thin and fairly basic, so don’t expect serious protection. If you need your Galaxy S5 to last a bit longer between charges then you’ll be pleased to know this case includes a 2,800mAh battery. Best case scenario, that’s enough juice to double the standard battery life. 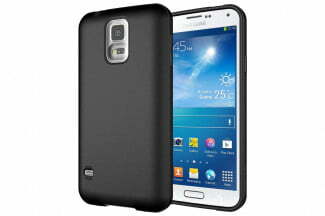 The clever design includes a dual-layer TPU case which is fairly slim and comfortable to hold. On the days you need extra juice simply slide it into the “Power Sleeve” and you can take advantage of the extended battery. It doesn’t interfere with NFC and you can charge and sync with the sleeve on. This is a simple, lightweight case in black with a clever fold out kickstand on the back that allows you to prop the phone in landscape or portrait orientation. It also comes with a holster that has an adjustable belt clip for easy and safe carrying. The case and holster have a rubberized feel that adds more grip. It’s a basic case at a reasonable price. Here’s the ultimate case for minimalists. The Incipio Feather is extremely thin, around 1mm, but the Plextonium material it’s crafted from provides durable protection. It has a nice soft-touch feel that makes it comfortable to hold and it comes in a range of colors including black, yellow, pink, purple, grey, and the pictured cyan. There are covers for the power button and volume rocker, but they don’t get in the way, and the cut-outs are very precise. Durable and functional, Seidio’s Dilex case has a malleable silicone inner layer with a tough exoskeleton. It can handle bumps and drops without a problem. There’s a magnetic kickstand for propping your S5 in landscape orientation. You also get a soft felt-lined holster with a swiveling belt clip. It’s surprisingly slim for a rugged case and you can choose from a variety of colors for the outer shell including blue, white, red, green, black, and pink. A combination of soft TPU inside and a hard polycarbonate shell is nothing new, but Spigen’s Tough Armor case combines style and protection very nicely. Air cushions in the corners are designed to disperse the shock of impact when you drop your S5. The back panel and the front lip ensure the phone is kept out of contact with potentially damaging surfaces. It also has extra big openings so you can easily use the heart rate monitor without removing the case. Handcrafted high quality leather cases from France add a real touch of style to your Galaxy S5. There are different finishes and colors available, but your choice could end up affecting the price. This case flips open toward you and has a window in the padded front cover so you can see your screen at-a-glance. The Galaxy S5 is well protected inside the case, and it doesn’t hinder any of the basic functions. You’ll find a few eye-catching cases from Speck, and this bright floral design is among the loudest. These Galaxy S5 cases aren’t just pretty either, they actually offer military-grade drop protection thanks to the dual-layer design which combines a hard outer shell with an anti-scratch finish and a shock absorbent inner lining. Button covers and cut-outs for ports and camera are all precise, so your phone will continue to be as useable as ever. Just a lot brighter. This TPU shell uses a special D3O material and a mesh pattern designed to absorb the shock of any impact, and dissipate it so your precious S5 isn’t damaged. The case is transparent and has all the precise cut-outs that you need to use the camera and access ports. It’s relatively slim and to give it some character, there’s a splash of orange around the edge. You can also get this case in blue or with a smokey finish. A hard outer shell and a rubber bumper makes a great protective combination for your Galaxy S5. The X-Doria case has a raised lip to protect the screen and button covers, but it’s the stylish 3D artwork that will attract you to this case. Thanks to a multi-layer printing process, these unique designs appear to have real depth and you can see past them to the phone beneath. If you don’t like the patterns you can get a plain version with a translucent back for $5 less. With a nice line in really rugged cases, Trident is a name you can trust, and the Kraken is the top of the range in terms of protection. This case can handle drops, vibration, dust, rain, and wind. It offers triple layer protection, including a screen protector, plus there’s a kickstand, a lanyard loop, and a holster. It is a bulky case, but it’s ideal for adventurous S5 owners who need a phone case to keep up with the pace. Wrapped inside this case, your Galaxy S5 should survive drops from up to 6 feet, and absorb any associated impact. The back is clear polycarbonate, while the sides and reinforced corners are made from TPE rubber. The design of the S5 shines through and you’ve got access to all your ports and the camera. It’s an understated look that delivers good quality protection for peace of mind. 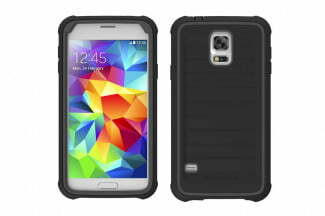 This is a one-piece case that despite being fairly slim, can still provide good protection from shocks, bumps, and falls thanks to the dual materials. The cut-outs match the ports exactly and there are covers to protect the buttons. 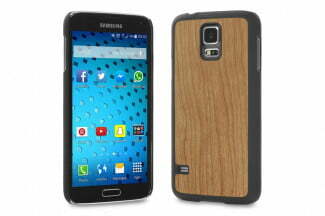 The case is sold in a variety of color combinations, or you can opt for a cool patterned finish. Otterbox makes cases offering more protection if you need it, but the Symmetry Series strikes a nice balance between style and protection. No, sadly it’s not real leather, but this svelte polyurethane case does manage to replicate the look and feel of the real deal. It’s neatly stitched and flips open like a book to reveal a hard shell that holds your Galaxy S5 in place, complete with a soft microfiber lining to protect the screen. It should keep your phone scratch-free and guard it against bumps and drops. If you just want a basic TPU case with some kind of Android design then you can always rely on Cruzerlite. Reasonable prices and decent quality make these flexible cases a great choice. They are transparent, shock absorbent, and they’ll keep your S5 free of scratches. If you don’t like this U.S. flag design, don’t worry, because there are many other designs to choose from. Urban Armor Gear really nails that sharp, angular industrial look here, plus the case lives up to the style thanks to military standards for drop protection. It’s a typical blend of hard outer shell fused with an impact resistant core. The case also comes with screen guard. There are neat button covers and wide cut-outs for the camera, so the flash shouldn’t be affected by glare. This lightweight case really delivers and if you don’t like the translucent version, you can pick it up in blue, orange, white, or black. That’s all the Samsung Galaxy S5 cases we have for now, but we will update this roundup with new entries worthy of your attention. Updated on 8-28-2014 by Simon Hill: Added cases from TYLT, PureGear, Incipio, Seidio, and Spigen. Article originally published on 4-8-2014.